To mieszkanie jest blisko zarówno do Central Parku i Riverside Park, zaledwie kilka przecznic od Lincoln Center i Metropolitan Opera oraz w pobliżu wielu sklepów i restauracji na Columbus Avenue, wyrażania i lokalnym metra jedną przecznicę od hotelu. Okolica jest bardzo zorientowane na rodzinę i ma dwadzieścia cztery godziny delikatesy, markety, apteki, księgarnie, kina, itp To studio mieści się w budynku z brązowego kamienia z przełomu wieków i choć ma 4 loty w górę i nie ma windy, jakość apartamentu sprawia, że ​​warto się wspiąć. Dwa mocne drzwi antywłamaniowe oraz prywatny domofon w mieszkaniu sprawiają, że budynek bezpieczne. Ładnie odnowiony z łóżkiem typu queen-size Murphy łóżko, plus jednym kanapą, południowej ekspozycji, wychodzi na ulicę. W pełni wyposażona kuchnia z lodówką, kuchenką dwupolowa, kuchenka mikrofalowa, ekspres do kawy i toster. Jest mała łazienka z prysznicem, bez wanny. Pościel, ręczniki, suszarka do włosów pod warunkiem. Istnieje również AC, telewizję kablową i internet wi-fi. The only reason I gave 4 stars instead of 5 is that the apartment was on the 4th floor without an elevator and without mentioning that, and also it wasn't so clean when we got the apartment and there are no cleaning services available. Besides that, great location with subway nearby (2 minutes walk), foods, 24/7 markets and 10 minutes walk from Central Park. Thanks for your 4 star review and we hope you will stay with us again. Just to be clear regarding this unit being on the 4th floor, we do mention in our VRBO description the lack of elevator. 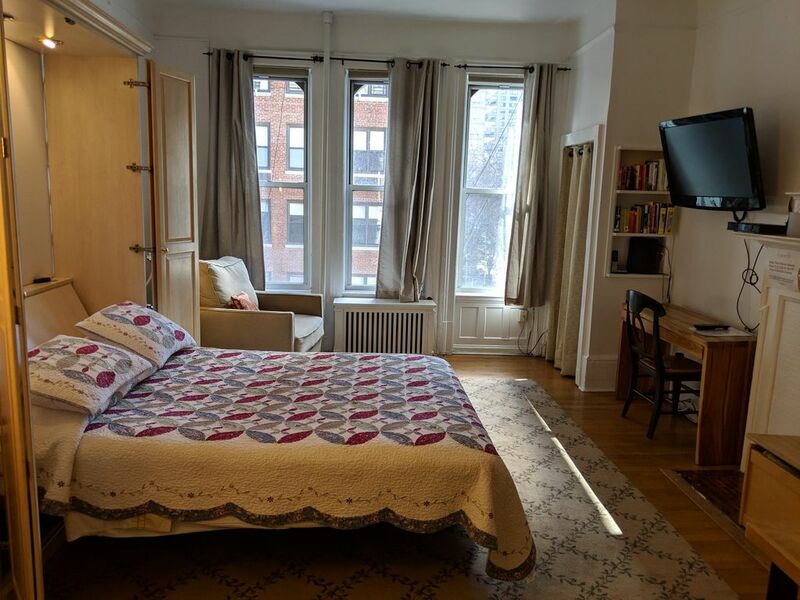 "This studio is in a turn-of-the-century brownstone building and though it is 4 flights up and does not have an elevator, the quality of the apartment makes the climb worthwhile." If you ever stay with us again, please let us know immediately if you think the apartment needs cleaning or if you need anything else. No, we do not offer cleaning "services" but we do offer supplies. I recall you asking for cleaning supplies and we asked that you stop by our office to pick up what you need. To my knowledge, you only stopped by for fresh sheets and towels. So next time, please don't wait until after you leave. Let us know immediately how we can help. Hope to have you with us again! The flat is very conveniently located for visiting, shopping, entertainment and eating out. Richard and Wayne were very helpful and responsive, and let us store our luggage after check out on the last day as our flight was in the evening. The air conditioning and cable TV were also very appreciated. a perfect home away from home, great location! A perfect location to enjoy the bustling upper Westside, close to everything. The apartment was light filled and had all that was needed to serve as a convenient, safe and efficient home away from home. The host was responsive and thoughtful. Would highly recommend!